North Point Press, 9780865477384, 624pp. 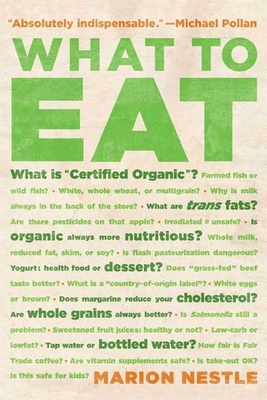 Since its publication in hardcover last year, Marion Nestle's What to Eat has become the definitive guide to making healthy and informed choices about food. Praised as "radiant with maxims to live by" in The New York Times Book Review and "accessible, reliable and comprehensive" in The Washington Post, What to Eat is an indispensable resource, packed with important information and useful advice from the acclaimed nutritionist who "has become to the food industry what . . . Ralph Nader [was] to the automobile industry" (St. Louis Post-Dispatch). How we choose which foods to eat is growing more complicated by the day, and the straightforward, practical approach of What to Eat has been praised as welcome relief. As Nestle takes us through each supermarket section—produce, dairy, meat, fish—she explains the issues, cutting through foodie jargon and complicated nutrition labels, and debunking the misleading health claims made by big food companies. With Nestle as our guide, we are shown how to make wise food choices—and are inspired to eat sensibly and nutritiously. Now in paperback, What to Eat is already a classic—"the perfect guidebook to help navigate through the confusion of which foods are good for us" (USA Today). Marion Nestle is the most respected nutritionist in America today. Her book Food Politics was given the James Beard Award, the top award for food writing; that book and its follow-up, Safe Food, are backlist classics for the University of California Press. A longtime nutritionist and former head of the Department of Nutrition, Food Studies, and Public Health at New York University, Nestle lectures worldwide and was featured in the movie Super Size Me. A native New Yorker, she raised her family in California and now lives in Greenwich Village.